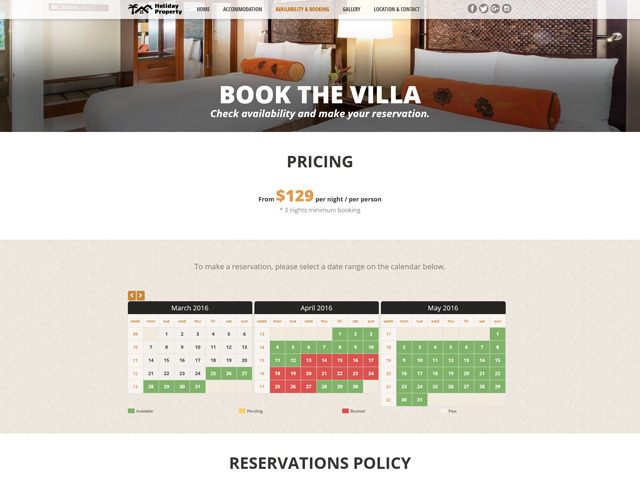 Show your holiday property availability and enable visitors to book their vacation online. The intelligent Property Rental Software allows you to manage prices, taxes and reservations, process online and offline payments, generate invoices etc. You can also trigger SMS & Email notifications to users and customers to keep both sides up to date. 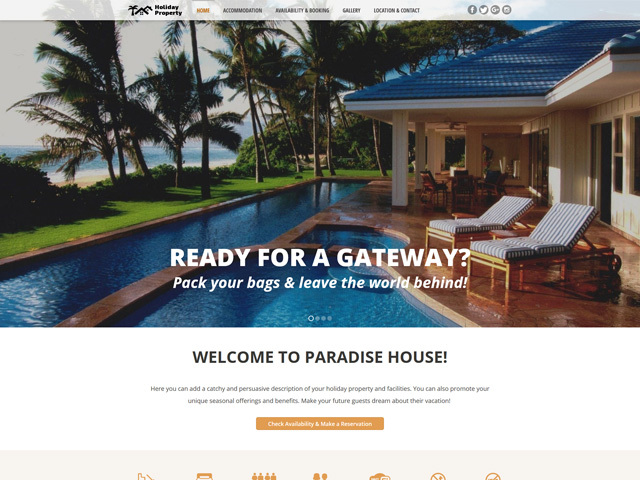 Promote your vacation home, using the Accommodation Page. The facilities allow you to describe your property by text description and breezy images. Also, VEVS holiday home websites are fitted with the most used pages and features. 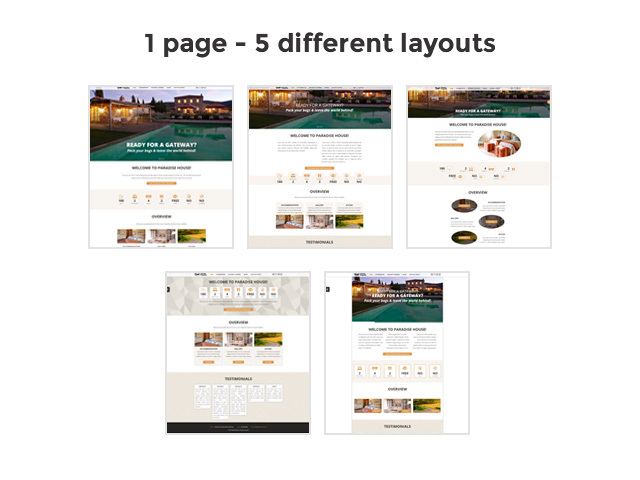 The choice is yours - 10 different color schemes and 5 changeable layouts for each web page. The contemporary view of your holiday property site possesses a simple navigation menu and quick icons to your social media profiles. 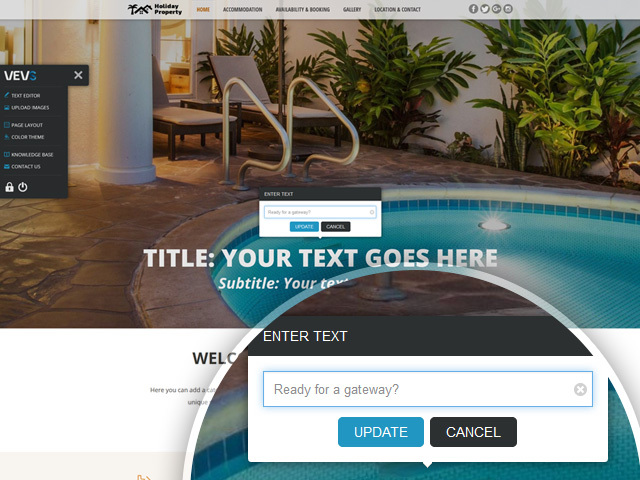 Update all texts and images on your property rental website using our friendly back-end system. It helps you to translate your site to multiple languages and to rename menus and titles. 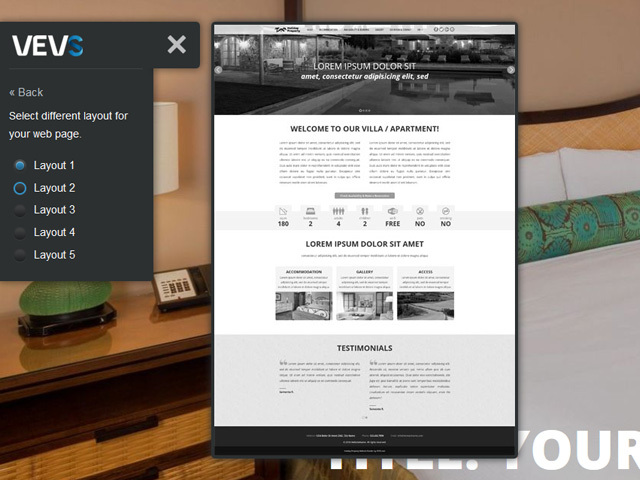 Show your holiday property’s availability and enable visitors to book their vacation. With it you are allowed to define the booking length, to accept single or multi date reservations and to make prices visible on the front-end calendar. VEVS holiday home website comes with a built-in property rental software. It enables you to accept online and offline payments, define seasonal prices, add costs based on the number of guests.